We traveled to Ocala, Florida to participate in the USDF Region 3 Championships. After our disappointment in Kentucky we were looking forward for Brocken & Gibraltar to show their excellent Talents and Training. Both qualified for 3 Finals and they did not miss a beat. Brocken showed on Saturday in 2nd Level Open and placed 7th out of 14, Gibraltar showed in 4th Level Open and placed 3rd behind Shawna Harding and Jan Brons. On Sunday Brocken & Gibraltar competed both in 3rd Level Open with 22 Entrants. Gibraltar placed 4th and Brocken shined and was Reserve Champion. Then followed our Freestyle competition. Brocken and Gibraltar both were awarded Regional Champion in their 2nd Level & 4th Level Freestyle. What a finish!! Congratulations to Debbie and THANK YOU to all that helped us achieve these results. See you all in Orlando for the USDF National Convention in December. We sure had our ups and downs at Kentucky Horsepark. We were excited to have made the Top Twenty in the National Young Horse Markel Championships. Only 17 Horses showed and fourteen were going to the Finals. In the Preliminary on Friday Debbie & Brocken had a decent ride, but when the Judges told her they had some Bad News which we were not ready for: We were eliminated from the F6 competion, because we did allow Debbie to enter the ring with her Whip. I also have to mention that Debbie's right foot was stepped on by River Side Lady (Berry) the night before and she found out after X-rays, that her little toe had a clean Fracture, but was very swollen. But she carried on and rode all Weekend. What a Fighter! On Saturday she made up for it and placed Third with Berry in the 4 Year Young Horse Final, a beautiful ride. That made us all fly high again. 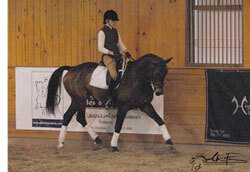 She also wrote Gibraltar in a PSG and a 4th Level Freestyle, in which she scored a 71.458%. 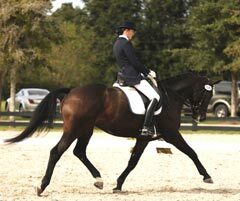 Because of Brocken's elimination we were able to ride her in the open Dressage Show Saturday & Sunday. 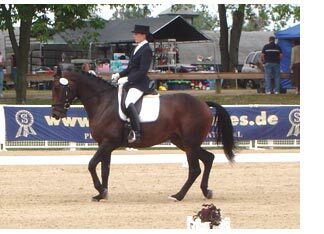 Debbie & Brocken rewarded us with a 65.349% in a 3/3 Test and won a 2/4 Test with a score of 71.190 %. Now it's off to the Regional Championship in Ocala in October. We will hold the whip for Debbie. We had another great weekend at the Ole South Show on 8/25/07. Gibraltar won his 4th Level Freestyle with a score of 72.600 % and placed second in a 4th Level & PSG. On behalf of the United States Equestrian Federation, Inc., I am pleased to notify you that your horse has been selected to compete in the 2007 Markel/USEF National Young Horse Dressage Championships (presented by Collecting Gaits Farm), to be held at the Kentucky Horse Park, September 14 – 16, 2007. Congratulations on this tremendous achievement! Brocken ended up 13th out of 20 to go. Debbie's other ride for the F4, River Side Lady, also placed 13th, so we are off to Lexington. 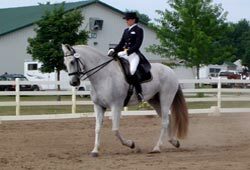 The Mid Ohio Dressage Classic was very successful for Brocken & Gibraltar under Debbie Hill. great score of 7.76 and repeated Saturday with 7.72 in her F 6 Tests. That looks very promising for the 6 year old Markel/USEF Young Horse Dressage Championships in September. Gibraltar scored a 68.5% in his 4th Level Freestyle and won his 1st FEI Prix St. Georges with a 65.5% out of 7 participants. 7.84. That should qualify her also for the 4 year old Markel Championships in Kentucky. So with a little Luck Brocken (top left) and Berry could (bottom right) make the Trip together to Kentucky Horse Park. 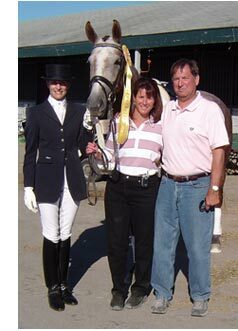 Our horses had a great showing at the Tennessean & Tennessean Express with Debbie. scored a 70.00% coming in 2nd. (all open Freestyles were combined). In her F6 Test she scored a 6.8 and we still have to work on those flying Lead Changes. We will retry in 3 weeks in Columbus, Ohio. Gibraltar also had a great weekend. He won two 4 th level test 3 with a high score of 72.927%. With his Freestyle 4th Level performance he scored 66.250% and came in 3rd behind Brocken. Gibraltar will try his first Prix St. George in Ohio. 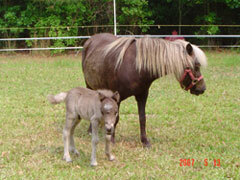 Our newborn Mini Colt is coming along fine and Snow-white should have our 2nd Piper Foal soon. 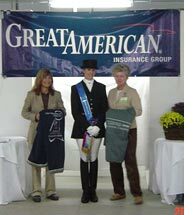 Our show at TRISTATE on the weekend of May 5th, 2007 was very successful for our 2 contestants under Debbie. Brocken won her 3 classes in 1st Level Freestyle and 2nd Level Freestyle. She won also Highpoint in 2nd class. 4th Level Freestyle Championships. Our next show will be Murfreesboro in June. We are also proud to announce a new Mini Colt born on 5/9/07 by Cody out of Piper. Mother and Colt are just doing fine as these pictures prove. We spent Easter Weekend in Madison, GA at the GDCTA Young Horse Symposium featuring Scott Hassler at After The Fox Farm. Despite the chilly temperatures there was a large crowd of auditors. Scott was happy to see the progress that Brocken had made since January. I was really proud when he commented that her training had no weaknesses. He decided we should move on and have some "fun" with her. We worked on half steps and working pirouettes. Brocken was very amenable to the new demands. We had two successful shows in Florida. At the ZADA Cup in Orlando Brocken scored 1 First Place, 2 Second Places and 1 Third Place. Her highest score was a 70.2% in a 2/1 Level. She also did her first F6 Test. 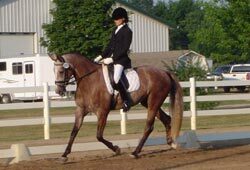 (this year we will need at least a 7.0 to qualify for the YOUNG HORSE MARKEL CHAMPIONSHIPS. All Brocken's classes were 2nd Level. Gibraltar did even better, he scored 2 First Places, 1 Second Place and 1 Third Place. He was also Highpoint in 3rd Level and even won $250.00. All Gibraltar's classes were 4th Level, except for the Highpoint 3/3Q. 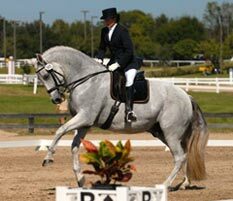 The following weekend 2/25/07 we competed at the Florida Dressage Concourse in Venice, FL. Brocken won all her classes in 2nd Level between 67.881 and 70.931. She also won her second F6 class with 7.14%. Brocken is now already qualified for the Regionals in 2nd Level and the F6. She will try later in the summer for 3rd Level and some Freestyle. 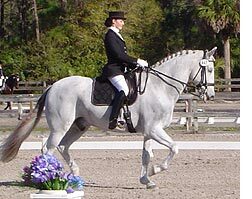 Gibraltar continued in his great form and scored First place in a 3/3Q with a 67.4% and a First and Second Place in 4/3Q with 65.3% as his best result. Gibraltar is now also qualified for the Regionals in 3rd and 4th Level. Debbie has this weekend a Cynthia Collins Freestyle Clinic were she will get updated Music for Gibraltar for 4th Level and new Music for Brocken in 2nd Level. We had a great Symposium with Scott Haessler in Jacksonville and enjoyed the Gala Event at the AHSA. 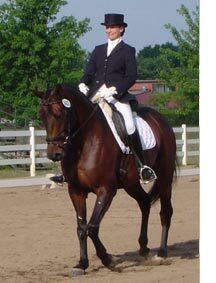 We have planned to have another Symposium with Scott at the AFTER THE FOX FARM on April 4 - 6 in Madison, TN to prepare for the YOUNG HORSE MARKEL CHAMPIONSHIPS in Kentucky in August. Then we will head as visitors to the World Cup in Las Vegas on 4/18/07.